More than 1,300 young people got experience working in industries ranging from healthcare and business to logistics, agriculture and criminal justice as part of Pima County’s Summer Youth Employment Program, sponsored by Pima County’s Community Services, Employment and Training Department and ARIZONA@WORK-Pima County. Pima County partners with several local agencies to offer the placements to youth age 14-21. The two sessions the county offered were June 4 -June 28 and July 2-July 28. Private-sector employers who hired students in the Summer Youth Program included Barrio Bread, Jim Click Automotive, Sargent Aerospace, State Farm Insurance and the Westin La Paloma Resort. Students also worked with Pima County Superior Court, the Public Defender’s Office, and with Pima County departments such as the Regional Flood Control District. The Regional Flood Control District asked the summer youth crew to focus on cleaning up open spaces and urban washes. Two groups of young people spent four weeks each removing trash and debris, including furniture, household items, mattresses and dozens of old car tires. 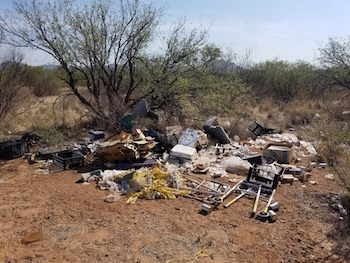 Ten students participated in each session, one in June and the other in July, working all over the Tucson area - from Big Wash in Oro Valley to Black Wash west of town. Due to the remote location of some of the projects, Flood Control Open Space Lands Manager Marisa Rice arranged for delivery of large roll-off trash cans for the students and staff to use at two sites, five in all. District pickup trucks hauled away litter from smaller jobs. The Summer Youth Program budget fluctuates each year, but, depending on funding levels, 1,100 to 1,500 young people can be hired, earning the Arizona minimum wage of $10.50/hour. This year, 3,364 young people applied, according to Daphanie Conner, program manager. Program participants are selected based on their applications, grades, assessment scores and work interests as well as available funding, applicant program selections, geographic area, employer/worksite requirements. The Summer Youth Program also includes basic education, in which young people can earn elective high school credits in math, reading and writing. Work hours range from 20 to 40 hours per week. Placements range from four to seven weeks depending on the specific work or education program. Participants attend a one-day “employability skills” workshop, where they learn about good work habits and employer expectations, before they ever go to work. That kind of preparation pays dividends.